One of the early signs that may suggest a problem with the brain, such as dementia, may be a disruption in sleep patterns. Why don't people with dementia sleep well? Learn how changes in the brain may affect the sleep-wake patterns due to damage of critical structures and how conditions present in assisted living environments may worsen these effects. The suprachiasmatic nucleus (SCN) in the hypothalamus of the brain is responsible for controlling our sleep-wake patterns. This is often called a circadian rhythm because these patterns tend to persist at a near-day period. With many types of neurodegenerative diseases—including dementias such as Alzheimer’s disease, as well as movement disorders such as Parkinson’s disease—certain areas of the brain may degenerate over time. Brain cells (neurons) may become less responsive to chemicals called neurotransmitters, or debris may build up disrupting their function. Global brain degeneration, called atrophy, may occur as individual neurons die off. In addition, specific regions of the brain may be lost. If the SCN is lost, our ability to maintain a normal sleep-wake pattern will be adversely affected. This may manifest in various circadian rhythm disorders. 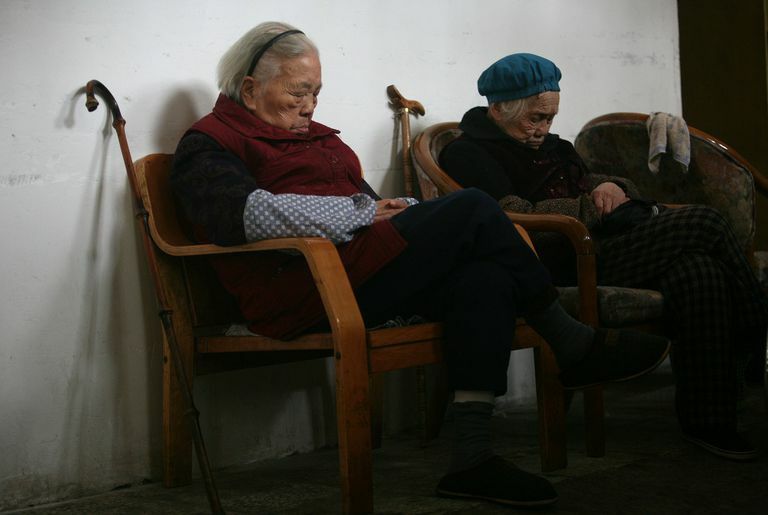 Often, the elderly will experience advanced sleep phase syndrome. This involves a desire to go to bed and wake up early. This desire to change their sleep schedule may be beyond their control and could represent changes in the brain as it ages. In addition, many individuals with neurocognitive impairment, as occurs in dementia, may have disrupted sleep-wake cycles. They may find their desire to sleep at night is diminished while they nap away the afternoons. Sometimes loved ones may become suspicious for dementia when an individual begins doing unusual activities during the night, such as housecleaning at 3 a.m. or other activities. Irregular sleep-wake patterns usually demonstrate at least 3 periods of sleep in 24 hours, with the overnight sleep often curtailed. The phenomenon of sundowning, in which a person with dementia becomes increasingly confused and agitated at nighttime, may represent a circadian rhythm problem. This behavior has been effectively treated with light exposure and melatonin, which may serve as time cues for reorientation. Often patients with dementia will be less confused if they are kept in familiar surroundings, such as a lifelong home, rather than a hospital or nursing home setting. In addition, the use of a routine may reinforce their memory and behaviors and allow for maximal success. It may also be possible that sundowning represents exhausted reserves; that is, at the end of the day the individual no longer has the mental energy to remain vigilant about their orientation and thinking. As a result, they become or may appear more confused. Sleep disruption may also be an early sign of disease that may develop far later. For instance, research suggests that rapid eye movement (REM) behavior sleep disorder may precede the development of Parkinson’s disease or Lewy body dementia decades before these disorders advance to some of the other common features. It is important to recognize that many neurological disorders have components of sleep disruption, as the processes may come to affect the area of the brain responsible for controlling our sleep-wake cycles. This may lead to disruption of these cycles, and variation in these circadian rhythms may be the first sign that something is amiss. By being carefully attuned to these changes, we can get early help for those in need. For those who are suffering from dementia, there can be a few helpful changes. It is important to maintain a regular sleep-wake schedule. Morning light exposure is critically important, and light during the day and darkness at night help to reinforce sleep patterns. Naps should be minimized during the day to optimize sleep at night. Low doses of melatonin may be helpful in some. Other over-the-counter and prescription sleeping pills should be minimized due to the increased risks of confusion, urinary retention, and falls. If sleep apnea is present, it should be treated to minimize long-term effects on memory. It is upsetting to consider the possible impacts of dementia. Whether you have noticed memory disturbances in yourself, or a loved one, it can be scary to anticipate what could be on the horizon. Fortunately, healthy sleep can help to protect and preserve the normal function of the brain. Simple changes and the treatment of sleep disorders like sleep apnea may lead to long-term benefits. If you need help, reach out to your family physician and consider a referral to a board-certified sleep physician if needed. Bachman, D. et al. "Sundowning and other temporally associated agitation states in dementia patients." Annual Review of Medicine. 57:499-511, 2006. Dowling, G.A. et al. "Melatonin and bright-light treatment for rest-activity disruption in institutionalized patients with Alzheimer's disease." Journal of the American Geriatrics Society. 56(2):239-46, 2008 Feb.
Gehrman, P.R. et al. "Melatonin fails to improve sleep or agitation in double-blind randomized placebo-controlled trial of institutionalized patients with Alzheimer disease." American Journal of Geriatric Psychiatry. 17(2):166-9, 2009 Feb.
Riemersma-van der Lek, R.F. et al. "Effect of bright light and melatonin on cognitive and noncognitive function in elderly residents of group care facilities: a randomized controlled trial." JAMA. 299(22):2642-55, 2008 Jun 11. Shub, D. et al. "Non-pharmacologic treatment of insomnia in persons with dementia." Geriatrics. 64(2):22-6, 2009 Feb.